She looks really happy :-) and reminds me off my Grandmother when she had one of her , rare , outbursts of laughter. You obviously put her at ease; her smile doesn\'t look forced at all. And the faux Nike hat is way too funny. Nice job. 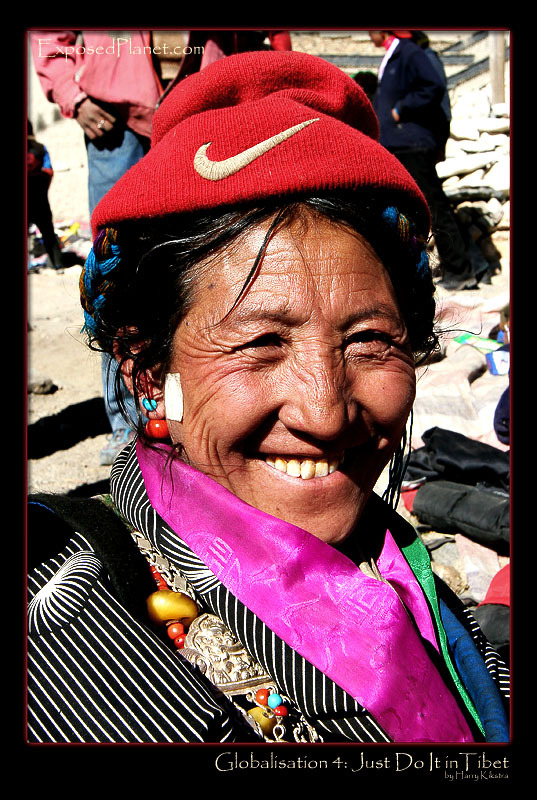 The story behind "Globalisation 4: Just do it in Tibet"
Many people had gathered in front of the Rongbuk monastery, the highest in the world. It was an open market to celebrate the visit of a high Buddhist, the Rinpoche. More like a flee market, people were selling mostly second hand clothes (5th hand more likely) and some refreshments. This woman looked so happy after I bought a drink from her, that I asked if I could take her photo. The fake Nike industry is very big in Asia and globalisation is entering all cultures. But of course I could not complain about that as I just promoted it myself by buying a can of Coke which tasted too good..